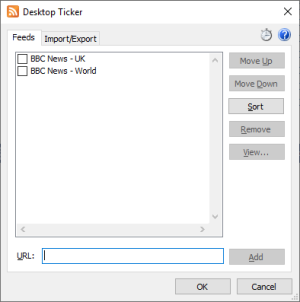 This page describes how to use the basic functions of Desktop Ticker. For details of the customisation options, click here. Place the cursor over the side of the ticker and hold down the left mouse button. The text size can be changed using the Options window. Place the cursor over the top or bottom border of the ticker and hold down the left mouse button. Click the menu button on the left of the ticker. Click the close button on the right of the ticker. Click the minimise button on the right of the ticker. Click the scroll buttons on either side of the ticker. Right click either scroll button to display the list of feeds together with the number of new items and the total number of items. Click on a feed to jump to it. 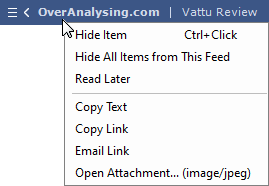 Right click on a feed item to display options for that item. Click the menu button and select File, Manage Feeds. To add a new feed, enter the address of an RSS feed or web page associated with an RSS feed into the URL box and click the Add button. To remove a feed, select it from the list and click the Remove button. Items from unticked feeds will not be displayed in the ticker. The list can be reordered using the Move Up and Move Down buttons. If the synchronization icon is shown ( ) then the feed list will be saved to the Windows Common Feed List. Click here to learn about locating and using RSS feeds. By default Desktop Ticker stores settings and data in the user profile folder. This means that different users on the same computer can each have their own settings, and on a network with roaming profiles a user can log onto any computer and their settings will be automatically transferred. 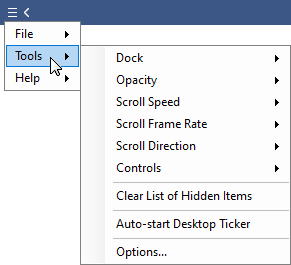 If you would prefer Desktop Ticker to store the settings in the same folder as the application file (for example if you run it off a portable USB device), uncheck the "Store Settings in User Profile" option on the File menu. Customisation options are accessed using the Tools menu. The dock options allow you to pin the ticker to the top or bottom of the screen. Once docked, dragging the ticker away from the dock position will undock it. The float option on the dock menu determines whether the ticker will float above other windows, or will reserve its own space in a similar fashion to the task bar. The opacity options provide a way to reduce the visual impact of the ticker. The smaller the value, the more transparent the ticker is. The speed that the text scrolls through the ticker is set using this menu. The speed can also be altered by pressing the keys Ctrl F or Ctrl S.
The scroll frame rate determines how often the ticker display is updated. More often (60 Hz) gives a smoother appearance, less often (30 Hz) may provide better performance on slower computers. This option determines the direction that the ticker scrolls, from right to left or left to right. This option controls whether or not a button to manually reload feeds is displayed. This option controls whether or not buttons to skip to the next or previous feed are displayed. This option will clear the list of items that have been hidden, causing them to reappear. This option opens a window containing further configuration options. Information about these options is on the next page. If you like Desktop Ticker please consider making a donation via PayPal or take a moment to leave a comment or review on a website. Donate your computer's spare power to scientific research.